Alec Hogg met with Andrew Feinstein in the modest London premises of Corruption Watch UK, the organisation into which the former ANC member of Parliament now invests much of his effort. Hogg started what turned out to be a cracking interview by asking Feinstein how well his book, After The Party, had sold. This was the book which exposed rampant corruption in SA’s R70bn Arms Procurement Deal…. Well I remember at the time we published it, which was in late 2007, my publishers said “We’ve printed 2 500 and if it does very well over Christmas then maybe we’ll need to print another 1 000 or so.” I, like them thought it would be good if we sold 3 500 books because I assumed people had forgotten about the Arms Deal and wouldn’t be interested in a personal story of trying to uncover it. In the first year it sold about 40 000 and I was only outsold by the Bible in that year. It’s been selling well in South Africa since then and then a couple of years later it was published internationally and did quite well in the UK and the US. It was really to the shock of both me and my publishers (Jonathan Ball). It enabled me to go on, to do the second book (The Shadow World), which was different – on the systemic nature of the global arms trade and how it impacts politics everywhere. I suppose the big issue, and the issue I try to bring out in ‘After the Party’, was the way the Arms Deal corroded our very young democracy in South Africa. Was it the turning point for South Africa? Undoubtedly, as the Mail and Guardian said in an editorial, the Arms Deal was the point at which the ANC lost its moral compass. I think that was right. Those early years were really symbolised by Mandela and everything he stood for in which the national interest was paramount. It was never about the party’s interest, as in the ANC. It was never about individuals, political interests or, even worse, material gains. It really was about what was best for the country. I think that changed very quickly and primarily when those Arms Deals were signed in 1999. I think that was the point at which people started thinking, well, it seems to be okay to use massive government contracts to buy equipment worth billions Rand that we don’t really need and that we haven’t used, as the Defence Minister again said in Parliament just a few weeks ago. It’s okay to do that and the fact that there was about $300m of bribes paid on these Arms deals. I think it was the point at which people within the ANC and in society, generally, started thinking well its okay to use the State to make money for ourselves. I don’t think South Africa is different or exceptional in this sense. I don’t think we’re unique. I don’t think we’re another Zimbabwe, as some people suggest. What happened in South Africa, the real tragedy of our situation, is that we adopted the very tawdry global norms of politics so quickly and so easily. That really for me was the tragedy. I think that’s the story of the arms deal because the arms deal was about international companies and governments coming into the country and, effectively taking us for a ride. A ride that cost us huge amounts of money – a ride that cost us, in terms of the forsaken socioeconomic spending. We will have spent R70bn on this weaponry by the time the contracts end in 2018. And when you think of the needs that our society had then, the most obvious of which was HIV and Aids. In the five years, after Thabo Mbeki became President, when he was saying we didn’t have the financial resources to provide antiretroviral medication to almost six million South Africans living with HIV or Aids. Harvard University conservatively estimated that 365 000 South Africans died avoidable deaths because of that policy decision. The consequences of this sort of corruption, this undermining of the rule of law and the effective functioning of the State – we can count in human lives. 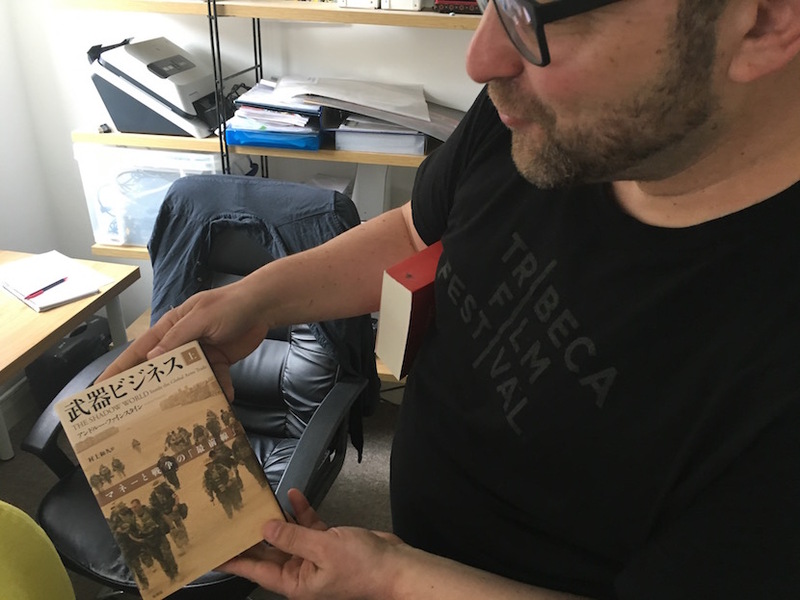 Andre Feinstein’s book on the global arms industry has been translated into many languages – here he holds the Japanese edition. Those are two extraordinary numbers – the 365 000 people who died needlessly, but the $300m in bribes is that consistent with global corruption in an arms deal of this size? Absolutely. While I was experiencing all of this tumult in South Africa, while I was a young, junior ANC MP, I became interested, not just in those who had been corrupted in my own party and the government officials, but also those who were doing the bribing and the corrupting. That’s what led me to the second book. What we established as we started researching the global arm trade – which by the way there hadn’t been a book written on the since 1979 when a brilliant British writer with South African connections, Anthony Sampson, wrote an amazing book called ‘The Arms Bazaar’. There really hadn’t been anything because publishers were scared of publishing on this topic. Writers must have also been scared of doing so? Absolutely. After my experience in South Africa, I came here to the UK. I worked with prosecutors at the Serious Fraud Office, the Department of Justice in the US on other similar sort of bodies. What we discovered that the quantum of bribes paid and the modus operandi used on the SA deal was common place. This was happening all over the world, all the time. The one deal that always sticks in my mind that brought this home to me was the United Kingdom’s deal with Saudi Arabia called Al-Yamamah, that started in the 80’s and carried on for over a decade. That was worth £43bn with around £6bn of bribes paid. Even Mark Thatcher, Margaret Thatcher’s son – Thatcher was Prime Minister at the time of this deal – received £12m. I realised that this was just accepted practice in this unique industry. It’s not like all other industries but this is the way business in this industry is conducted. It cleared everybody except the critics of the deal! We were the evil doers and they said our evidence and information was based on nonsense…Unfortunately, the Seriti Commission was the most extreme variant of, again, what is common practice in this industry. It’s important to bear in mind this industry is responsible for so much corruption. A study by Transparency International calculated that about 40% of all corruption globally happens in the defence sector. And when the US Department of Commerce wanted to study five years of corrupt deals by American companies, over 50% of those landed up being in the defence sector. The primary reasons for that: first of all the companies are incredibly close to their governments and because it’s national security and national defence, the nature of that relationship is very different to a normal state to business. The second thing is that everything that happens in this trade is behind a veil of national security imposed secrecy, which makes it much easier to hide the dirty deeds. You can understand that from a national security perspective however, it’s been used to hide what is really just criminal conduct. When the Seriti Commission was launched we -myself and my colleagues like Paul Holden, Hennie van Vuuren, and other people who’ve done a lot of work on the deal – engaged very closely with the Commission. We sent them a 200 000 word submission. We sent them a disc of evidentiary documents that we collected from all over the world, which unfortunately they lost, so we sent them another one. We even arranged meetings for them with people internationally, prosecutors and others who’d been involved in investigating the deal. We were really hopeful that they would reveal the truth of the deal. Then when we were supposed to give evidence it kept on being postponed. Eventually, they decided that the government people would give evidence first. So all of those government people involved in the deal gave evidence and to our astonishment they weren’t cross-examined. They weren’t asked any questions. So they could effectively say whatever they liked and even if there were documents that contradicted what they had said, or information, even in the public domain that contradicted what they said – they weren’t asked anything. We then started cross-examining some of the witnesses. For instance our pro bono legal team in South Africa cross-examined former President Mbeki, and he said there was no way there could have been any corruption in the deal. Our lawyers started producing documentary evidence. For instance, minutes of meetings from one of the winning companies in Germany, noting that Chippy Shaik, who was head of procurement in the defence force at the time, had asked for a $3m bribe. The German company’s directors even minuted their discussion of the bribe and their decision to pay it to a nominee company in Liberia. There were six or seven similar documents from our investigations. The former President kept on saying that he’d never seen or heard of any of these documents or any of these cases. And we’re talking now, for instance, a settlement between BAE, the British Company and the US Department of Justice and State Department, in which BAE had to pay $500m in fines, and had to admit that they’d paid what was euphemistically called “unauthorised commissions” on seven arms deals, including in South Africa. Mbeki had never heard of any of this. What astonished us was that Judge Seriti also claimed never to have heard or have seen these documents. Our lawyers had to point out to him that we had sent them to him years before. Then he took the extraordinary decision that all of this evidence could not be admitted to the Commission. 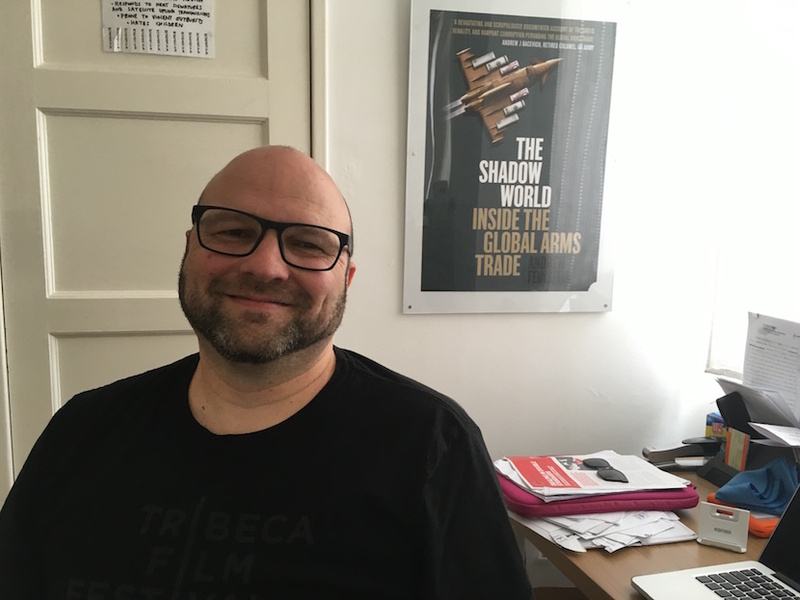 Political activist and former ANC MP Andrew Feinstein has spent most of the last decade investigating the global arms industry which he believed to be responsible for 40% of all bribes paid anywhere on earth. The film based on Feinstein’s resulting book, The Shadow World, was launched in April and has been winning awards everywhere from the New York’s Tribeca Film Festival to Edinburgh, where it was adjudged the best movie on show. Well, there weren’t really any grounds. The grounds that were given were that we were not the authors of these documents, which is the basis of investigative journalism globally that we had sourced these documents from various places. Most of them had been published, not just by us, but by journalists in the US, in the UK, in Germany, France, in Italy, and all over the world. There had been investigations related to them and when he refused to admit this documentary evidence we were very concerned. Then when the first so called critic started to give evidence, they were grilled and treated in the most appalling manner by the Commission. We got really concerned and took a decision on the advice of our lawyers to stop any cooperation with the Commission and we called for the disbandment of the Commission. This really came about because a number of senior people resigned from the Commission and three of them said publically that they had resigned because they believed there was what they called ‘a double agenda’ in the Commission. That its agenda was to whitewash any corruption in the deal on the one hand, and to discredit the so called critics of the deal on the other. That was really the end for us. So we put all our evidentiary onto a website called Armsdealfacts.com, through the Right2Know organisation and started calling for the Commission to be disbanded. It wasn’t. The report came out – the report is a whitewash effectively, and I really am hopeful that South African civil society will see fit to legally challenge that report because that’s what needs to happen. Is it similar to what happens in other parts of the world – do they also have commissions of enquiry that turn out to be whitewashes? Well no. What tends to happen in the rest of the world is either they don’t get investigated at all, which happens a great deal and which is why we are so committed to doing this work, of investigating and revealing stories of corrupt arms deals. What does happen sometimes, as for instance happened on that Al-Yamamah deal with Saudi Arabia I mentioned – the UK Serious Fraud Office held a massive enquiry into that and an investigation. But months before he left office (former Prime Minister) Tony Blair closed down that investigation. The evidence of corruption in that deal was staggering and overwhelming. But Tony Blair had become very close to BAE as a company. He had been personally involved in selling some of the deals, including the South African deal. It was the act of ultimate political cynicism when he closed down that investigation and led to the resignation of a whole raft of senior staff from the Serious Fraud Office. It profoundly undermined the UK’s credibility in terms of anticorruption. The UK was very severely reprimanded by the OECD’s Anticorruption Working Committee and I don’t think the UK has ever really recovered from that. But that just gives you the sense that politicians and these companies work very closely together, to protect each other. What happened in South Africa wasn’t a surprise, in terms of the way these things happen. Clearly you won’t be surprised by the latest news then, where Tony Blair has been viciously attacked by the latest Commission here in the UK on the whole Iraq War. Well, the first thing that surprised me about the Chilcot Commission of Enquiry into the Iraq War and the decision to go to war is that it was a very, hard hitting report. I think a lot of people expected it to be something of a whitewash and Tony Blair personally, was as you say, heavily criticised. Lord Chilcot argued that Blair had committed himself to the US going to war in an extraordinary letter to the then President George W Bush in which he said effectively, “I will be with you whatever.” Chilcot blamed Tony Blair again for the fact that the intelligence, on which the decision was based, was completely over-egged by Blair, himself. He effectively, misrepresented that intelligence and the extent to which the Iraqis were actually likely to have weapons of mass destruction. He did not adequately consult his Cabinet, let alone Parliament. One of his Cabinet members in our film, ‘Shadow World’, which was made from my second book, actually suggests that Blair lied to Cabinet, that he lied to Parliament and that he lied to the British public. Many British people believe that. The report came very close to saying that. ‘The Shadow World’ has been made into a movie produced by Danny Glover, the famous Hollywood actor, and so far to rave reviews…. Yes, it’s been extraordinary to see. The film premiered in New York in April. It’s just only out in the world. We spent a month with it in South Africa and we’re hoping to take it back for a much longer period very soon and yes, what we uncover in the film is that this is the way global politics operates. That senior politicians, like Blair, Bush, even Obama are very closely tied in to this industry. A former Marine Colonel and Chief of Staff to the US Secretary of State and the top soldier in the US, Colin Powell, tells us in the film is there’s this small national security elite that effectively propagates war to ensure that the defence sector remains very profitable. They pour a huge amount of money into politics and set the political agenda. It ensures that war is a preferred option to diplomacy. Making the film was a terrifying experience because we saw the extent to which this industry has become intertwined with the highest levels of governance but without the checks and balances that are or should be normal in a democratic society. In Shadow World @andrewfeinstein lifts the veil on corruption on the Arms Industry. It is mind boggling. I recommend it!! Andrew, the other area South African’s are concerned about right now is another huge multinational industry, known for paying bribes, is the nuclear sector. Have you done much work on the proposed SA nuclear deal? We’ve done a little bit of work and we have started to talk to colleagues in South Africa about that deal. There are a number of civil society organisations. There’s a court case going on in South Africa at the moment where an organisation called Earthlife Africa is actually taking the Government to court around the deal. We have experience, a little bit of experience with the nuclear weapons industry. This is the nuclear power generation industry. Unfortunately there are overlaps between the two and we are very concerned about it. We are very concerned because it appears to us from the outside that South African President Jacob Zuma seems to be having conversations with the Russian President Vladimir Putin about this deal in a very one-on-one, personal basis, when there is supposed to be a huge process taking place, a technical process in South Africa about deciding who will win these contracts. In financial terms, nuclear is going to make the arms deal, which cost us R70bn, seem like small change. This is our real area of concern and what we’re trying to do with the film in South Africa is we’re trying to say to people look, we found out about the arms deal. I started investigating it in Parliament only after the Auditor General’s Office had done a report that raised prima facie evidence of corruption but was more than a year after the contracts were signed. We know about this nuclear power deal before any contracts are signed. So we, as South African citizens and I remain a South African citizen (I only have a South African passport to this day) need to ensure that our Government is transparent and accountable on what is going to be by far the most expensive contract in our democratic history. The only way that is going to happen is if citizens and taxpayers, who ultimately are going to foot the bills, demand of our Government that it is transparent. If the Government continues to conduct the discussions and negotiations around this deal, as they have to date which has been very secretly, taxpayers and citizens should stand up and protest and say this is not acceptable to us. We are not prepared to have another arms deal on a far greater scale and just as, when we had other crises of our democracy, like the crisis around HIV and Aids. Our citizens and taxpayers need to have their voices heard outside the gates of Parliament until the Government realises that it can’t enter into these sorts of deals in ways that are personally beneficial to individual politicians. Those individual politicians are saying this is BEE, a way of distributing wealth to the previously disadvantaged….. I am a huge proponent of the fact that the economic nature of South African society has to be fundamentally transformed. I believe in the economic empowerment of all of those who were disadvantaged by hundreds of years of apartheid. It is the only way that we are going to have a fair and just society in South Africa. The problem is that the way in which BEE has manifested in South Africa to date has been that a very small group of individuals, who are very well connected politically to the upper reaches of the ANC. And that group of individuals changes as the politics of the ANC changes and the leadership of the ANC changes. But this very small group of individuals are the ones who have been benefiting from State contracts. Unfortunately there are a number of occasions in which one can trace some of these companies, who become beneficiaries of these deals, ultimately to political interests and to political individuals. This is exactly the sort of investigative work that we do and it’s work that has to be done on this nuclear deal. There has to be information in the public domain that makes clear that every single entity benefiting from this nuclear power deal has no links, direct or indirect, to any politician, to any political office bearer, to any State Official, or their family or their close friends. If that sound draconian then the reality is after the absolute scam that was our arms deal – this is the very least that the South African public should expect on a deal that will be many sizes bigger than the arms deal. If the arms deal saw $300m in bribes paid, what is the size of the likely bribery that could be involved in the nuclear deal? In the arms trade most of the bribes, depending on the person involved and the nature of the deal, and the counties involved – it will be anywhere between 5% – 35% of the contract value. Now, not being an expert on the nuclear power industry my instinct is that it will probably be similar. We don’t have a figure as yet, what we do know is that it is going to be in the trillions of Rand rather than the billions. So we’re talking about bribes in the tens of billions of Rand. 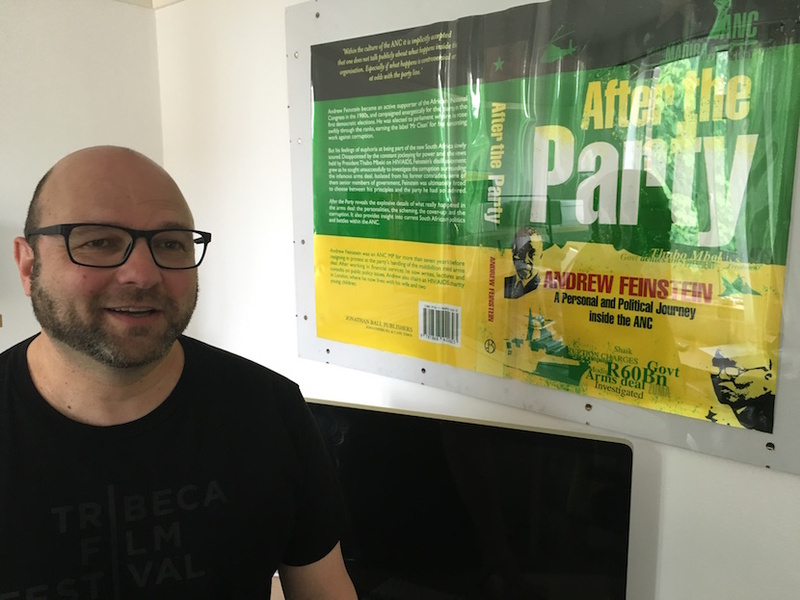 Former ANC MP Andrew Feinstein, who wrote the bestseller After The Party, reckons South Africa’s proposed nuclear build deal could generate “tens of billions” in bribes for politically connected elites. So there’s a huge amount at stake here for those who would be accepting or receiving those bribes. Why might they or how might they be convinced to do the right thing? They’re never going to be convinced to do the right thing. They’re going to have to be forced to do the right thing. Unfortunately our recent history is not a good indicator of their attitude to transparency and accountability on these matters. So we look not only at the Seriti Commission and the way in which the arms deal has been covered up, but we look at things like the Nkandla scandal, where the Presidency and the Parliament of the country were prepared to violate the constitution, according to the Constitutional Court, to protect the President, who has now accepted, benefited personally and financially from the upgrades to his homestead at Nkandla. It was only once the Constitutional Court had so ruled that the ruling party was actually prepared to acknowledge that mistakes had been made. We know about this nuclear deal before we get to that tragic point. The only way our politicians are going to be forced to conduct a transparent process leading to the final allocation of these contracts to the people who are right to undertake them, and to determine who are the correct companies – we first have to determine whether this approach to power generation is in fact the most effective, efficient both in cost terms and in terms of how it will deal with the power crisis in the country that’s the first thing. We then need to ensure that work has been done properly. Then if we do say that nuclear power has to be a part of the power generation needs in the future of the country, we have to ensure that we get the right power generation from a country and a company that is the right one. Not the one that’s going to pay the biggest bribes. The only way we’re going to do that is quite literally if South Africans come out onto the street. If there are petitions in South Africa signed by the vast majority of South Africans who are going to be footing the bill for these deals – to say to our President and to our ruling party ‘if you do this thing that will be the end of your democratic mandate in this country’ and we make them understand that while they think they might benefit financially from these deals – they will lose out politically, and they will no longer have political power. If you go back to the Seriti Commission what is being done with the proposed nuclear deal, and many others – are you confident the corrupt can be forced to change? At some point the penny will drop. I think we will see very small signs of it in the municipal elections. I think we will see what I would describe as economically populist parties, such as the Economic Freedom Fighters, gaining support. I think we will see the ANC still with a lot of support but losing support possibly even in one or two quite crucial municipalities – that will be the start of the message but it’s going to take a bit longer. In terms of the nuclear power deal I think the reality is for the sort of mobilisation process that is required around the country for the process of informing people about what’s at stake that we can only talk about the 2019 elections. But we can talk about getting people working on these things in the next few months and I know that there are plans for organisations to start doing this sort of work. I think there will come a point when the vast majority of South Africans, and I’m talking about them as voters here, regardless of all other demographics, will start thinking. With the information that we now have do we think that the people who have been running the country since the advent of democracy are serving our best interests? I think come 2019, for the first time, we will see meaningful numbers of people starting to question that assumption. Andrew, you were an ANC member, you were a senior ANC member. You were an activist from a young age. Are you still a member of the party? I actually don’t know I’m embarrassed to say. I haven’t paid my dues, which was supposed to be paid annually since 2001, when I resigned from Parliament just before the ANC were about to kick me out from Parliament. I don’t know whether that means my membership has lapsed or whether I’m a member not in good standing. I just recall a few years ago when I made a comment about the president of the country and the president spokesperson was asked about my comment and his response was, “Feinstein knows that, as a disciplined member of the ANC he should raise these issues in his branch.” Now, I’ve never described myself as a disciplined member of anything, so if I am still a member of the ANC, which as I say, I’m unsure about. I’m definitely no longer a disciplined member of the ANC. I would find it impossible at the moment to vote for the ANC. So you would vote against them? I’m not sure. I find myself in a difficult situation, not just in South Africa but even in the UK where I live. I don’t have an obvious political home. I think the state of politics, globally is appalling. If we look, for instance in the United States of America a recent poll suggested that 68 percent of Americans thought that Donald Trump would make an appalling president and 58 percent of Americans thought that Hillary Clinton would make an appalling president. So what a choice that is? Where the vast majority of the country’s electorate are starting an electoral process thinking that neither of the candidates would make a decent president? I think that is reflective of the state of representative democracy, globally. So I would love to see the creation in South Africa of a political force that I felt completely comfortable with and what would that be? Obviously, it would be a political movement that was completely committed to honest, clean, and effective governance that goes without saying. But it would also have to be a political force that itself, in its own dealings and its own leadership reflected the values of accountability, of transparency, of openness, and of honesty but that was also crucially very sensitive to the history of our country and to the reality that we had 350 years of racial authoritarianism and an economic system that reinforced that. As a consequence of that one has to do something to ensure that one can redress that but do it a way that affects the vast majority of South Africans and not a tiny clique of individuals, who happen to be politically connected. At that point I would find it very easy to vote again in an election but at the moment I don’t. Are you hopeful, optimistic, or pessimistic about your country? I am deeply disturbed by some of what has gone on over the last few years in South Africa, by the ANC and by the Government, from the very top of Government downwards. What gives me hope about South Africa is when I was there with the film a month ago, not even a month ago but a few weeks ago, for a month is that I see young South Africans across all incomes, all races, certainly all genders, all ethnicities who hold such promise and who don’t have the political baggage that people of my generation have. People who grew up seeing the ANC as our liberators from a young age, who want what is best for the country and I take that, together with the reality that there are on average, according to police reports, so this is probably a huge underestimate but there are on average about 13 or 14 social protests every day in South Africa – around local services, around corruption, around labour issues. This makes me feel that South Africans are not prepared to just accept the status quo. That gives me hope that particularly a generation or two younger than myself, will really be at the forefront of bringing about the sort of democracy and the sort of society that all South Africans deserves.